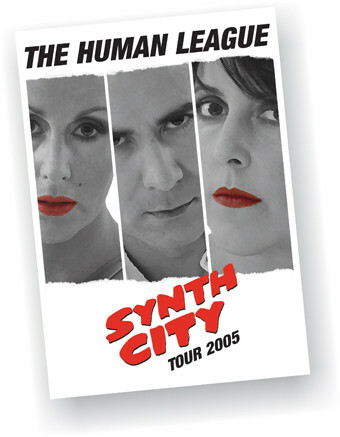 'Synth City' was Oakey's idea, as a tribute to the movie of almost the same name. This was great fun - a logo! a logo that could be placed on practically everything. Instead of a ordinary programme, it was suggested to do a postergramme. A cut-out of previous photos of individual band members - a bunch of effects, gave it the comic/cartoon-esh look, combined with dividing up the programme in cartoon boxes. The first version included Oakey with red lips as well, but that was rejected. 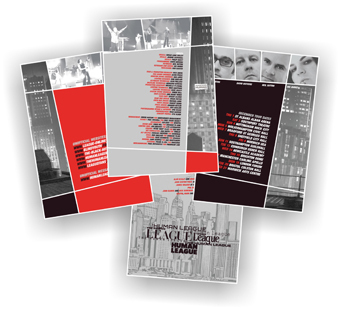 The city scape on the front and back, is a scanned sleeve of the band's first single 'Being Boiled' - everything seemed to go together pretty well together. I still feel this is visually the best work I've done for the band so far. Pages: 8 - poster on the other side. Size: folded A4 210 mm x 291 mm. Postersize: 840 mm x 594 mm. 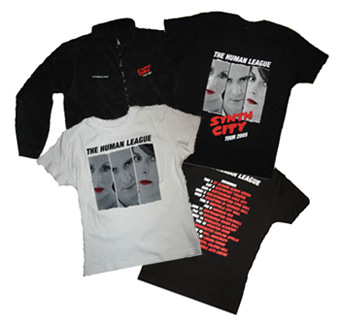 Other than the postergramme, mugs, t-shirts, a fleece, a beanie hat and a black bag with SC logo's were produced. 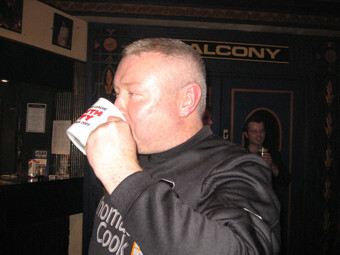 A volunteer were kind enough to test if the mug could hold beer - in this case, it sadly wasn't for long.